Abhijit Panse’s uproarious biopic on the controversial politician is an affectionately remembered portrait. The early portions of the film, rendered in soft black-and-white, bear the impression of a family photo book. In them, Thackeray, played by a Nawazuddin Siddiqui, sits stretching out his legs on the floor of his living room — like a benign grandfather regaling guests with wisdom and a sudden wisecrack — as the world turns around him. There is splendid craft to be found in this ostensibly political film. A disillusioned Marathi man hurls a stone at a South Indian Udipi restaurant, and we match-cut to a cricket ball breaking through a window of Thackeray’s house. “I’ve hit a sixer,” argues the cricket-enthusiast leader, while the children around him declare him out. Later in the film, he praises batsman Javed Miandad for his excellent sweep off Chetan Sharma in the 1986 Austral-Asia Cup, but refuses to relent on the cricket ban against Pakistan. As both umpire and coach of warring ideologies, Thackeray chooses to sacrifice the lesser sport. Amrita Rao plays Meena Tai Thackeray, Bal Thackeray’s wife and the mute matriarch of the Thackeray clan. She sobs when reading her husband’s letters from prison, serves tea and mutton to Sharad Pawar, and worries if Indira Gandhi is a subscriber of Marmik, the Shiv Sena magazine that carried many funny cartoons of the lady Prime Minister. Last seen in the 2013 film Satyagraha, Amrita makes a weak comeback, looking confused and overwhelmed in most scenes, pondering the enigma of her onscreen husband. But so does the film. It presents the contradictions of a man who claims to detest democracy, but declares ‘people’ as the highest court there is; a man who ignites riots then sends out remedies. Yet this biopic — directed by MNS leader Abhijit Panse and written by Shiv Sena MP Sanjay Raut — remains unflinchingly celebratory in its tone, painting Thackeray with the cinematic swagger of an underdog gangster fighting the good fight. This is no different from, say, Kaala, where Rajinikanth stood up as the Dalit warlord of the same labor-force mocked and vilified in this film. Pa Ranjith’s movie had shown us the collective power of Mumbai’s cycle-riding idli-vendors, while in this one Thackeray urges his Marathi adherents to open stalls of vada pao (Watching an early morning show on an empty stomach, I felt terrible for my city broken over breakfast). This film belongs to its leading man. 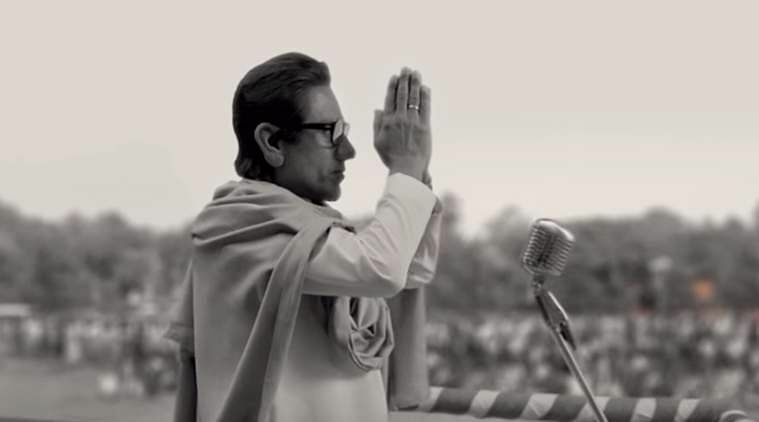 Nawazuddin Siddiqui brings a committed composure to the part of Bal Keshav Thackeray. The actor wreaks menace with the slightest tilt of his head, looking not as much in height or facial texture, but in sheer postural power like the great orator of massy, chucklesome speeches. A section of this film delves into the Bombay Blasts of 1993, and I was reminded of Nawaz’s brief appearance in Anurag Kashyap’s Black Friday. The tables seem to have finally turned for the actor — from a meek accomplice in the vicious blasts to one of its prime targets — and he fumes with the same fury as of his early days. Only Nawazuddin Siddiqui could have come this far; he whimpers as well as he roars.